Most businesses need to use a mixture of debt and equity funding to finance their operations. This mixture of debt and equity is referred to as the capital structure or capitalization of the business. 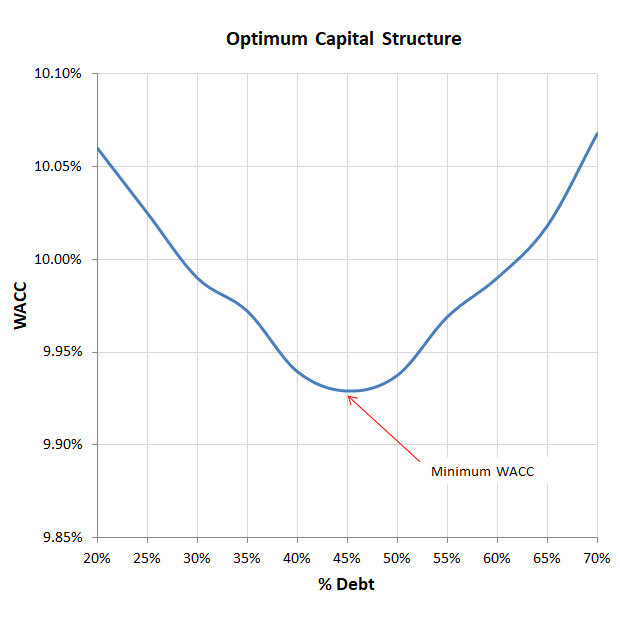 The optimum capital structure is the one which minimizes the weighted average cost of capital (WACC) and as a consequence maximizes the underlying value placed on the business. The weighted average cost of capital is given by the following formula and can be calculated using our WACC calculator. This formula shows that the weighted average cost of capital depends on the degree to which debt is used to finance the business. This is sometimes referred to as the gearing or financial leverage of the business, and is represented by the term D/E in the WACC formula above. The cost of debt is normally cheaper than the cost of equity as the lenders of debt finance incur less risk than the investors who provide equity finance. The lenders risk is lower as their interest payments are always made before dividend payments to investors and, in the event of a liquidation, they receive repayment of their principal debt amount prior to investors receiving the return of their invested capital. In addition, interest payments on debt are treated as an expense for the purposes of calculating tax, the effective cost of debt is therefore reduced. This is represented in the WACC formula above with the term kd x (1 – t). As dividend payments are not allowable as an expense for the purposes of calculating tax, the cost of equity is not reduced in the same way. Taking these considerations into account, on the face of it, the optimum capital structure is therefore the one with the most debt as this should produce the lowest WACC and the highest valuation. The simple explanation above, seems to indicate that the optimum capital structure for a business is one which has a high level of debt, as this is the cheapest form of external finance. However, this assumes that the cost of equity (ke), and the cost of debt (kd) remain constant for all levels of financial leverage. In practice, as the financial leverage increases and the debt percentage increases, more and more interest is paid from profits and less and less is left for dividends. As a consequence of this, the business becomes more risky for the providers of equity finance and the cost of equity (ke) starts to rise. Furthermore, as debt increases the additional risk causes the credit rating of the business to fall and the cost of debt (kd) also increases. In addition, there comes a point where no further tax relief is available on the interest payments (tax exhaustion), and the effective cost of debt increases from its after tax amount given by kd x (1 – t), back to the gross amount of kd. In the above example this would mean an effective increase from 4.9% to 7%. The conclusion is that the weighted average cost of capital (WACC) is high when the financial leverage is low, due to the higher cost of equity, but is also high when the financial leverage is high, due to the increased risk. Somewhere in between the two highs there will be a level of debt and equity which gives the lowest WACC representing the optimum capital structure. This is demonstrated in the diagram below which shows how the WACC changes as the percentage of the business funded by debt is increased from 20% to 70%. Suppose a business is funded by 80% equity and 20% debt and has a tax rate (t) of 30%. The business has low financial leverage and has a cost of debt (kd) of 5.00% and a cost of equity (ke) of 11.70%. Using this information, the WACC is calculated as follows. The WACC is high and predominantly influenced by the high level of equity the business has. Consider now what happens if the same business has a high financial leverage and is funded by 30% equity and 70% debt. As a consequence of the high levels of debt, the business is regarded as higher risk by investors and the cost of equity increases to say 24.20%. In addition, the credit rating of the business falls and the cost of debt also increases to say 5.73%. The WACC is now calculated as follows. At even higher levels of debt tax exhaustion might even result in the loss of tax relief on the interest payments. If in the above example the tax relief on interest payments was not available, then the WACC would be calculated as follows. Due to the loss of tax relief the WACC has jumped from 10.07% to 11.27%. In this example, the optimum capital structure which gives the lowest WACC is 45% debt and 55% equity. At this level of financial leverage if the cost of equity is say 15.11% and the cost of debt is 5.14% then the WACC is calculated as follows. A business can chose either debt or equity to fund its operations. Although debt is the cheapest form of external funding, too high a level of debt can result in both an increase in the cost of equity, as the risk to shareholders increases, and an increase in the cost of debt, as credit ratings fall. As a consequence of this there is a theoretical optimum capital structure which minimizes the weighted cost of capital (WACC) and therefore maximizes the value of the business. While debt is the cheapest form of funding, for a startup business it is not always readily available, and in practice a business may be forced into accepting a corporate capital structure which is far from ideal. When preparing forecasts using the financial projections template you should first carry out a capital structure analysis to establish the current capitalization of the business, and then determine its optimum capital structure taking into account the concepts discussed above, industry norms for financial leverage, and the limitations imposed by the financial market place on available debt and equity finance.